The cacophony of a crowd of people at the entrance of Bangkoa Wooden Jetty just across historic Fort Rotterdam caught my attention as we as a group crossed the street and started to meander into the throng. I wasn’t much aware why such a heavy presence was massing as we pushed our way while the lingua franca, Bahasa Indonesia, was filling the air combined with the sound of engines starting, laughter and other ambient sounds. A neat line of motorcycles flanked the already narrow road, as if Moses came and made the parting while curious looks darted from everywhere. We ourselves, our own languages (we are bloggers from six ASEAN countries) and English added to the cacophony. Several meters after, we were at the small wharf, where wooden smaller traditional boats were tied tightly at one side, dancing to the waves and larger ones, ready to accept her passengers. The day was bright and promising, cheerful as we ourselves were giddy with the day’s itinerary: swim and snorkel and have fun at an uninhabited islet. 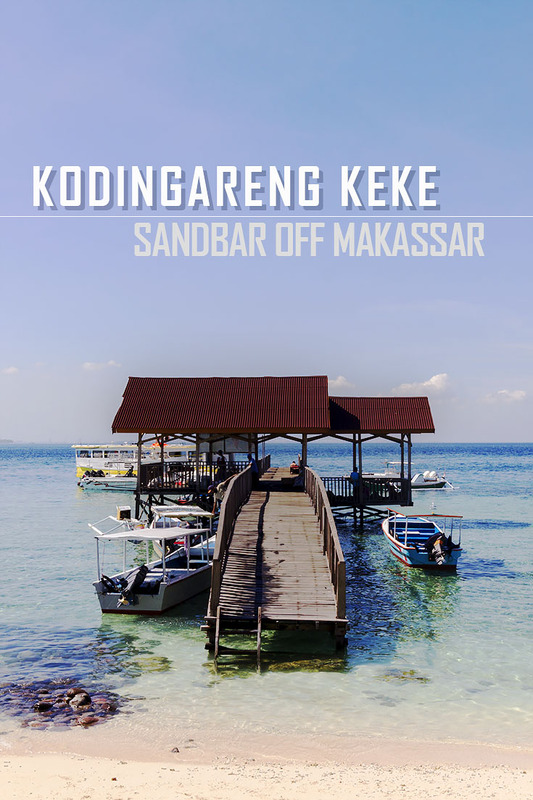 Kodingareng Keke, despite the muffled giggles from us from the mother country, is just but one of several islets off the western part of South Sulawesi and in fact, the jump off point is Makassar where we were staying. It’s a sliver of white sand in a sea of aquamarine, teeming with corals and fishes, and sea urchins and other marine life. Although uninhabited, there’s a three level gazebo in the middle that gives a great view of the whole island from both sides and a wooden jetty that unfortunately, never reaches the shore and one has to surrender to the sea and have his feet wet even before he has put down his bags. There were other groups besides us in the islet, spread out into the other corners and spaces while we gathered at the second level. The view was great. The sea was inviting and all I can think was, should I snorkel or not? Or just go to a deserted edge where the sand was wider and float. To feel the water around my body as the languid tedium of the waves would want to bring me to a state of bliss. I love beaches. I love deserted islands. I love to just swim and float and stare at the sky while at the edge of a sandbar like when I had a great time in Bantigue Island in the Isla Gigantes group in Iloilo. I love how the water transitions from cool to warm and transfer to another part and experience the same. I love the rush of the waves at a sandbar’s edge, the glass like translucence of the water while it makes a mad rush from one end to the other. And I love just floating on the surface and let my thoughts wander. I scanned the different portions of Kodingareng Keke. The lifestyle bloggers were busy preening and posing for the camera at several areas. Other bloggers were at another side, snorkeling, eavesdropping on the not so private lives of marine animals. But at the other end, where the sand was wider and only a few people were swimming, I found my spot. I found my place in the island. I found my own part of the world where I can just relax and enjoy. GETTING THERE: Kodingareng Keke is reached by renting a wooden boat at the Bangkoa wooden jetty near Pantai Losari and just opposite Fort Rotterdam and depending on the size and agreement, starts at 500,000 Rupiah. It’s possible to cook food in the islet but what usually visitors do is spend time in the islet then have lunch or stay at Pulau Samalona, around 30-40 minutes away where you can arrange to have your food cooked and stay at the several homestays there but prior arrangement is necessary. There are also houses for rent in this island that can accommodate as much as 20 people. Lovely account of Makassar, Estan. Loved the clean sand and clear water. Nisha, thanx for the comment. Indonesia is quite overwhelming, in a positive way. Really beautiful and lots of interesting things and places and food! Haha. Well in the first place, the urchins were only at a small area. Then second, really pristine waters. I enjoyed floating and swimming near the tip which was calm and the water cool.